Batteries are the heart of any off-grid energy system. And with solar and battery storage exploding in the last 5 to 10 years, equipment manufacturers are constantly putting out products that are more efficient and ever lower in price. 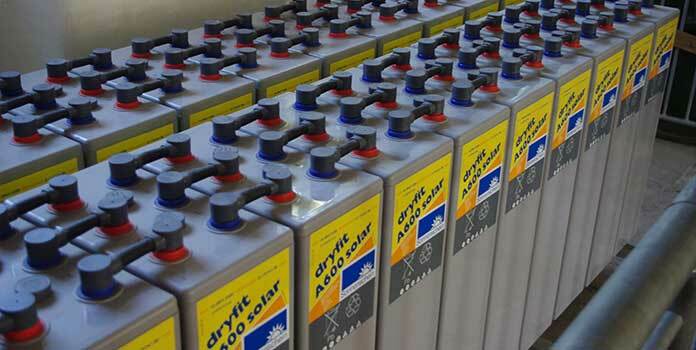 If you’re looking to install an off-grid solar installation, batteries are an integral component of that. And, with so many battery manufacturers all touting the merits of their own technology, it can be hard to discern which ones are the best batteries for solar off grid. We’ve created this short battery guide to help you on your quest to disconnect from the grid! Below, we go over the main types of battery technology for off-grid solar installations, how to calculate a battery’s long-term cost-effectiveness, and overview the factors to consider when purchasing batteries for solar. There’s no right or wrong answer when choosing batteries. Instead, it’s finding the battery that fits your specific needs. A battery’s size and cost are certainly important, but they’re not the only things to consider. Cycle Life and Depth of Discharge also play a huge role in your battery’s overall cost-effectiveness. Let’s take a look at all these, as well as battery voltage, so you’re armed with the info you need when it comes time to purchase your solar batteries. Prices for batteries start at just $100 to well into the thousands, depending on size, reputation, and voltage. You can buy a cheap 100 amp-hour, 12-volt battery for around $150, but the 13 kWh Tesla Powerwall costs $5,900. The larger the system, the more you’ll spend. The purchase price is probably the first thing we all notice when we’re looking at any product. For battery storage, it’s obviously, the #1 factor in long-term cost-effectiveness, but it’s not the only consideration. For deep-cycle batteries typically used for solar installations, capacity is simply the size of the battery, measured in amp-hours. The higher the amp-hours, the more electricity it can store. Think of a battery’s capacity like a bucket. If a bucket can hold 5 liters of water, its capacity is 5 liters. If your battery’s capacity is 500 amp-hours, it can hold 500Ah of electricity. Your battery’s capacity should be based on your electricity needs. More gadgets and appliances means you should choose a bigger capacity. 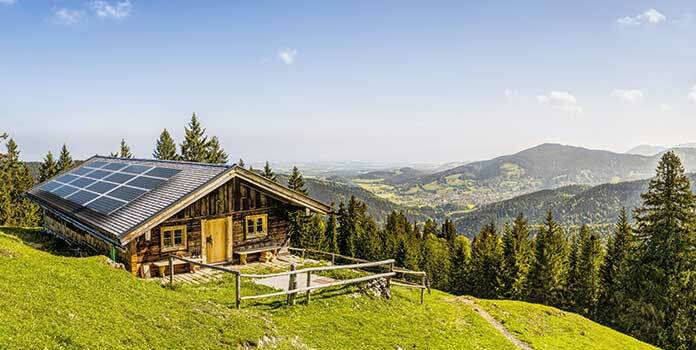 Battery capacity for solar installations range from a low of around 100Ah for the smallest set-ups to 1,000Ah or more for big off-grid cabins. Voltage for battery storage is usually limited to 12 volts, 24 volts, or 48 volts. Batteries, however come in all sizes: 2 volts, 6 volts, 12 volts, 24 volts, and 48 volts. By connecting a group of batteries in series, you can increase voltage to your desired system voltage, ie, two(2) 6v batteries connected together creates a 12-volt system. The relationship between voltage and capacity can be quite confusing. You might think that the amp-hours of a battery is all that matters in regards to the amount of electricity available, but that’s not the case at all! Picture that you’re standing on a bridge, looking down on a river. Voltage is the width of a river. Amperage (a.k.a. electrical ‘current’) is like the water’s speed. Put them together (voltage x amps) and you get watts, i.e., the total amount of water moving through the river just below you. The higher the voltage, the more water (i.e. electricity) can flow through at a single point, so you don’t need as many amps to reach the same watts of power. On the flip side, if the amperage increases (ie higher flow), you could reach your desired wattage with the voltage staying the same. Despite this confusing description, the formula for watt-hours is really simple: amp-hours x voltage = watt-hours. Simple, right? How to choose your battery system’s voltage? Speaking generally, small off-grid systems typically run 12 volts (a campervan or RV, for example). Higher voltage creates a more efficient system, with less electricity loss, so the bigger your system’s capacity, the higher the voltage. So 24 and 48 volt systems are usually reserved for larger off-grid systems. You might be disappointed to learn that you can’t actually use the full capacity of your battery. Depth of Discharge (DoD) is the percentage of your battery’s total capacity that you can repeatedly use without permanently damaging the battery’s lifespan. The higher the DoD, the more of your battery’s capacity you can safely use. DoD varies greatly depending on battery technology. Lead-acid batteries can only safely be discharged to 50%, while lithium-ion and nickel-iron batteries enjoy ridiculously high DoD rates of 80% (meaning you can use 80% of the battery’s total capacity). Cycle life and DoD are inversely connected. The deeper you discharge your battery, the fewer cycles it can handle over its entire life. To help you decide how deeply you should discharge your battery, manufacturers typically include a graph or details of this relationship in each battery’s spec sheet. Before purchasing your battery, take a look at this chart and compare it to a few other options available. How Do You Compare Them All? You’ve seen above that there’s a lot of variety when it comes to batteries. Some enjoy low sticker prices. Others last a very long time. Some can be discharged more deeply than others. And of course, there’s all different sizes and voltages as well, making it even more confusing to compare costs. How do you take all this into account so you can compare apples to apples? Don’t worry, it’s not hard at all to get a rough estimate of a battery’s long-term value. We simply need to calculate each battery’s cost per kilowatt-hour for ALL the electricity it will ever store and pump out. Usually expressed as $ per kWh, this data point takes into account initial purchase price, capacity, voltage, depth of discharge, and cycle life. Pretty cool, huh? This one data point gives you a glimpse into almost every facet of the battery. That’s an expensive battery, but you get the point! Having the $/kWh cost allows you to compare the cost-effectiveness of any battery, regardless of technology, size, cycle life, and DoD. Yes, you should feel empowered! If you’re looking at batteries for off-grid energy storage, you’ve got three different technologies available, each with their own unique drawbacks and benefits: lead-acid, lithium-ion, and nickel-iron. We would’ve included Aquion Energy’s much-touted saltwater batteries in our list, but they’ve been extremely quiet since their bankruptcy in mid-2017 and have yet to reenter the residential market. Let’s take a look at each of these three technologies, as well as the major players in each space. 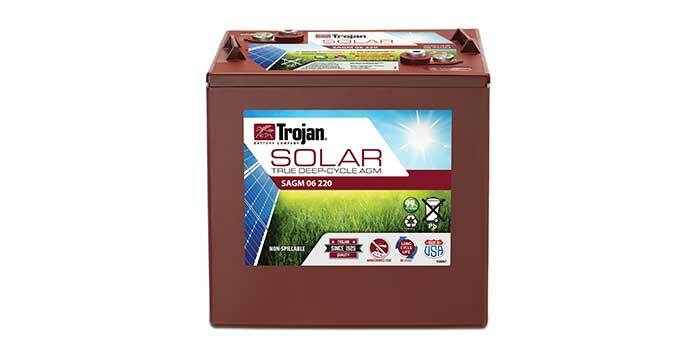 A sealed lead-acid battery from Trojan – a respected name in battery storage. 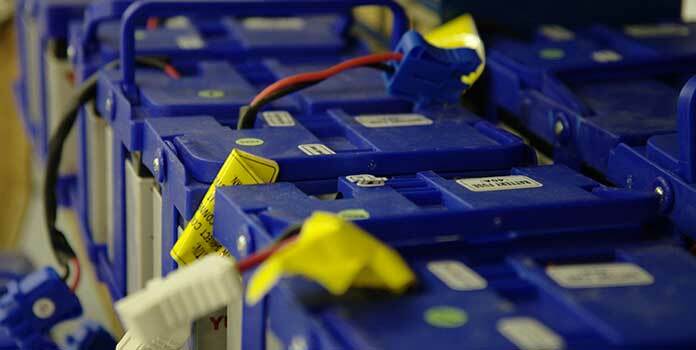 Lead-acid batteries are the old favorite for all things energy storage. We use them every day in our cars to start our engines and they’re popular with off-griders as well, as they’re cheap, time-tested, and reliable. Unlike our car batteries, lead-acid batteries for energy storage (ie connecting to a solar installation) are designed for deep, long-term use. ‘Flooded’ lead-acid batteries are the cheapest options around, but need to be maintained semi-regularly and placed in a well-vented, secure area, as off-gassing can occur and the caustic acid inside can leak if tipped over. Helpful tip: It’s easy to tell if a battery is a flooded lead-acid because it will have vents on top to let the gas escape. If you’re installing your batteries in your garage, RV, or other enclosed space, you probably don’t want to install batteries that can emit noxious gases into your living quarters, so instead consider Absorbed Glass Mat (AGM) or gel batteries. These use the same lead-acid mixture to store electricity, but also include additional components that prevent off-gasing. As such, these batteries can be completely sealed, allowing users to install the batteries in areas that are difficult to access, as they don’t require any maintenance like flooded batteries. And, since they’re sealed, AGM and gel batteries can be placed on their sides as well without fear of leaking, allowing you to optimize storage space. With these extra perks though, sealed batteries cost more than flooded lead-acid batteries, but it can be well-worth the cost. With lead-acid batteries’ low cost, versatility, and reliability you might be wondering where the problem is. Well, here it is: Lead-acid batteries suffer from a shorter cycle life (typically around 800 to 1600 cycles) and shallower DoD (usually 50% recommended DoD) than the other batteries we look at below. You’ll need to replace these batteries much sooner than the others on our list, possibly negating the cost savings you see from their low initial purchase price. 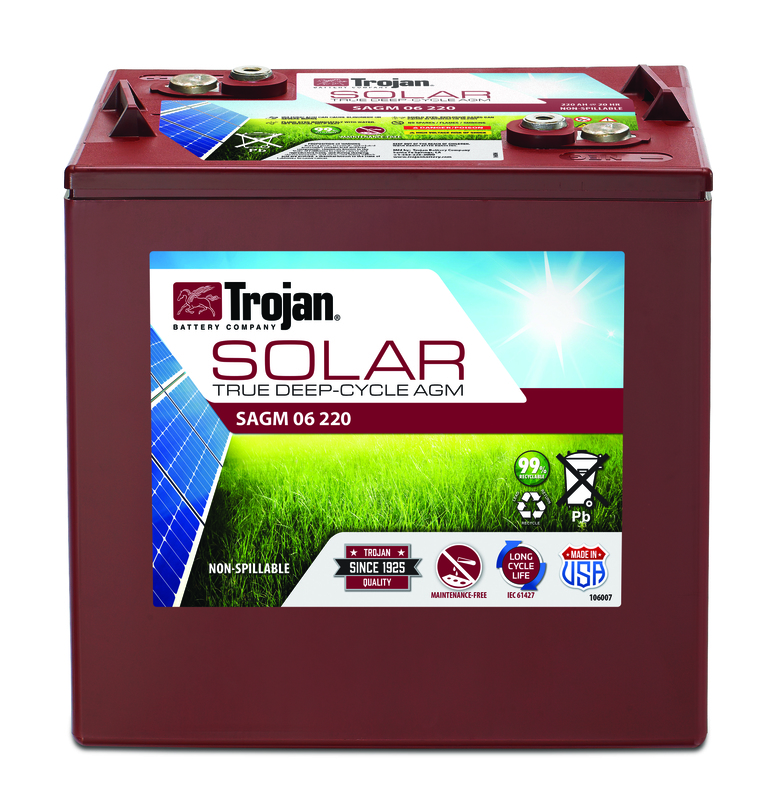 Compared to the batteries below that suffer from higher initial costs but LONG lifespans, this Trojan battery is actually pretty pricey in the long run. So, you actually get the exact same cost-effectiveness. Very interesting. On top of all this, lead-acid batteries are also extremely heavy compared to lithium batteries, something to consider if you’ll be installing a large battery bank in your RV or need to carry the batteries up a hill to your remote cabin. Of course, if your batteries will simply be left in your shed or garage, lead-acid’s weight isn’t really a problem. Bottom Line: Lead-acid batteries are reliable, time-tested, and cheap. If you’re worried about off-gassing, look into sealed options (AGM and gel), but be prepared to spend more. Sealed or unsealed, all lead-acid batteries suffer from low DoD and short cycle life compared to lithium and nickel-iron, which can affect their long-term cost-effectiveness. As with any purchase, be sure to do you calculations before deciding! 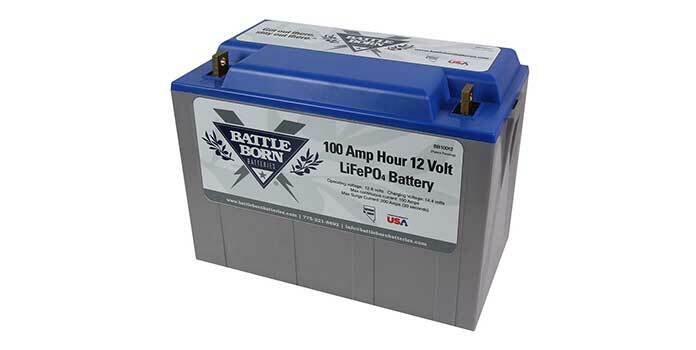 It might look the same as the lead-acid battery above, but inside Battle Born’s lithium-ion technology is quite different. Lithium-ion batteries are so hot right now, thanks mostly to Tesla’s Powerwall. Secondly, and more importantly, lithium-ion batteries are incredibly durable, with extremely high DoD (80%) and incredibly long cycle lives (3,000 to 10,000 cycles). When comparing performance only, lithium-ion batteries beat the pants off lead-acid batteries any day. However, that awesome-ness comes at a cost. Lithium-ion batteries are routinely 500% to 700% more costly than similarly-sized lead-acid batteries. Yes, pretty crazy. But as we already know, that purchase price isn’t the end-all-be-all for cost-effectiveness, and lithium’s fantastic DoD and cycle life certainly work in its favor. Let’s take a look at an example. So, the lifetime kWh cost is actually less than the Trojan battery above, despite the extraordinarily high purchase price. Lithium-ion batteries from most other manufacturers don’t enjoy cycle lives that are quite as long. Smart Battery’s lithium-ion batteries, for example, see cycle lives around 3000 to 5000 cycles. Be sure to look over the spec sheet and do your homework (ie, cost-effectiveness calculations, like we continue to walk through) before purchasing any products. Bottom Line: The high initial cost is certainly a burden, but lithium-ion batteries’ long cycle life and excellent DoD mean they can reach even greater cost-effectiveness than cheaper lead-acid batteries. Because of their high initial cost and long-life, lithium batteries make sense for off-griders who plan to use their system for years to come and have the experience to properly install the system (ie, correct ambient temperature, correct charging and discharging, etc) so the batteries can operate at max functionality over their entire estimated life cycle. You probably haven’t heard of nickel-iron batteries, but they’re gaining in popularity as more people learn about their mid-point price and incredible life cycle. Iron Edison, the leader in nickel-iron batteries, wraps up their benefits as such “The everlasting battery. Never worry about changing your solar battery again.” And indeed, with an estimated lifespan of 11,000 cycles at 80% DoD, nickel-batteries see longer lives than even the longest-lasting lithium batteries, and at a lower cost to boot. On top of that, these batteries are as near indestructible as batteries can get. Thanks to the burly materials used inside, they can withstand abuse (overcharging, over-discharging, low temperatures) that other batteries simply can’t handle, making it perfect for off-grid installations. Why haven’t nickel-iron batteries taken over the world? Along with these incredible benefits, nickel-iron batteries do have their downsides. Yup. You read that right. At $0.09 per kWh, it’s the cheapest option on our list. 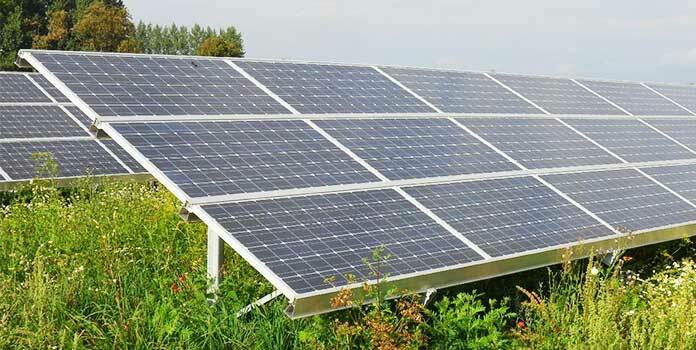 And at this rate – even tacking a solar installation’s cost onto your off-grid system – you could actually spend less than if you purchased electricity from the utility, depending on your area of course. Pretty cool! Bottom Line: The most cost-effective option on our list – as long as you’ll use them (and regularly maintain them) for the next 30 years! A great option for those of us who can make long-term commitments. Lead-acid batteries are cheapest upfront, but don’t last as long as the others, lowering their cost-effectiveness. Lithium-ion batteries are the biggest investment, but enjoy long lifespans and require little to no maintenance. Nickel-iron batteries are the most cost-effective option, but need a long-time to see that return on investment and need regular maintenance. Before you make any decisions for your off-grid system, don’t forget to read up on each manufacturer’s reputation and warranty. A product is only as good as its warranty! And, be sure to do those $/lifetime kWh calculations so you can set yourself up for financial success. All of the batteries above are great options, it’s just a matter of finding the one that suits your life. Did you find our overview of batteries for off-grid solar helpful? Let us know in the comments! Interested in installing solar to go along with your batteries? Reach out to a few installers and see what they can do for you.